the castle are not open to the public, but the grounds and the gardens of the demesne are open for the public to explore. Ireland’s Historic Science Centre, a museum of Ireland’s historic scientists and their contributions to astronomy and botany, is also located on the castle grounds. There has been a castle on the site since 1170, and from the 14th to 17th century the O’Carroll family ruled from here over an area known as ‘Ely O’Carroll’. After the death of Sir Charles O’Carroll, Sir Laurence Parsons was granted Birr Castle in 1620. Parsons engaged English masons in the construction of a new castle on the site. This construction took place, not on the site of the O’Carroll’s black tower, but at its gatehouse. ‘Flankers’ were added diagonally to the gatehouse at either side, giving the castle the plan that it retains today. After the death of Sir Laurence Parsons and of his elder son Richard, the castle passed to his younger son William. During the Irish Rebellion of 1641 William was besieged at Birr for fifteen months by Catholic forces. After the Civil War, William’s son Laurence refurbished the castle. A later descendant, Laurence Parsons, 2nd Earl of Rosse, also engaged in some re-building, and heightened and ‘Gothicised’ the castle in the early 19th century. His son William Parsons, 3rd Earl of Rosse, was responsible for the construction of the great telescope at Birr. 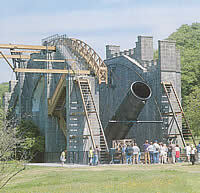 When completed in 1845, it was the largest telescope on earth. When the 3rd Earl died, his sons carried on the scientific tradition, and the 4th Earl (Lawrence Parsons, 4th Earl of Rosse) is noted for measuring the heat of the moon. After his death in 1908, the telescope fell into disrepair, the mirror was taken to the Science Museum in London, and circa 1914 the telescope’s metal supporting structure was melted down to be used in the First World War. In 1925 the wooden structures around the walls were demolished for safety reasons. Following several intermediate restoration attempts, the telescope was restored more completely in the latter half of the 1990s, and is now open to the public. A demesne is made up of the lands held by an estate for its own use and occupation, incorporating, farmlands, gardens, buildings and woods. This system can be traced back to the early medieval era, when home grown items were put aside to produce both goods and profit for the estate. 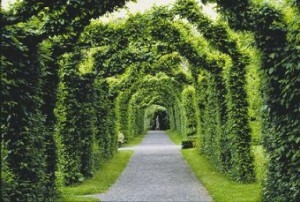 In the 18th and 19th centuries various styles and fashions of landscape ornamentation created new emphasis and changes of garden size and layout. The small kitchen garden and orchard originally developed at Birr is completely different from the garden today enjoyed by thousands of visitors to the demesne every year. 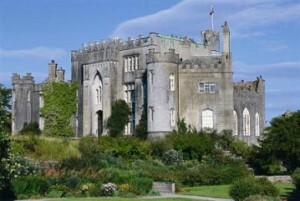 Birr Castle Demesne has become world famous for its exotic tree and plant collections, rivers and lake, formal gardens, terraces and wildflower meadows. Birr Castle is located in the town of Birr, County Offaly. Birr is a designated Irish Heritage Town with a carefully preserved Georgian heritage. Birr lies on the N52 and N62 national secondary roads. The routes are combined as they pass through Birr. Bus Eireann provide public transport services to the town. The Athlone to Limerick service regularly passes through the town daily. Kearns bus service provides a number of direct bus services to Dublin from Birr. The town has many amenities, such as shops, supermarkets, public houses and restaurants.